An environmental friendly biodegradable cationic rice starch polymer was prepared from the broken rice. This natural polymer was assessed and applied in the treatment of the oil refinery waste water where it showed a noticeable improvement in the values of organic matter, turbidity, colloidal silica and chloride ions to lowest levels by applying 10 mg/l of cationic rice starch polymer alone. Also, by using (6) mg/l of that polymer together with (25) mg/l of ferric chloride, in the clarification of the waste water, showed very good clarity. Details, of scenario, methodology, and the obtained results are discussed and presented in this study. Petroleum refining is one of most important industries in which crude oil is converted into more than 2500 refined products. These products act as human welfare backbone as all modern activities depend on them including liquefied petroleum gas, motor gasoline, aviation, diesel, fuel oils and lubricating oils, and also as feed stocks for the petrochemical industry. One of the difficulties facing oil refining is the usage of large amount of water in the refining processes, including cooling systems, distillation, hydration, and desalting. Oil refinery waste water is generated from different sources including tank drains, equipment flushing, surface and run off waters . The refinery waste water may be categorized as process or non-process waste water. In deep conversion, refineries which are categorized as recent ones, these different waste waters are directed to separate sewer systems. This elevates the capacity of the waste water treatment plants, increasing the efficiency of individual treatment units and expanding the possibilities of waste water reuse in different refining units [2,3]. Oil refineries produce polluted waste waters, containing chemical oxygen demand (COD) and biochemical oxygen demand (BOD) levels of approximately 300-600 and 150-250 mg/l, respectively. Phenol content of 20-200 mg/l; oil levels 100-300 mg/l in water outlet of oil desalting unit and up to 5,000 mg/l in storage tank bottoms; heavy metals levels includes Cr contents of 0.1-100 mg/l and 0.2-10 mg/l of pb in conjunction with many other pollutants including suspended matter . According to the nature of the refinery waste water pollutants, combination of the treatment methods often applied before discharging. Therefore, it becomes very important and essential to develop more effective techniques to remove pollutants and suspended matter in waste water by using environment friendly biodegradable coagulants that naturally abundant or modified products such as cationic starch polymer and others [5-7]. The treatment processes include the removal of the above mentioned substances using clarification which is commonly accompanied by coagulation, flocculation, and sedimentation [8,9]. The conventional clarification refers to combination of these three processes. In clarification processes, almost the coagulation involves neutralizing charged particles to destabilize the total suspended solids (TSS) then the flocculation process starts when neutralized or entrapped particles begin to collide to form enormous particles. These processes are improved by the addition of some additives including polymeric flocculants. The effectiveness of these polymeric flocculants strongly depends on the molecular weight, charge density and other chain structural properties [10,11]. Commonly, the charges of most polymeric flocculants for instance cationic rice starch are distributed along chain supports which offer stronger attaching points to anionic particle surfaces. Tertiary amino groups which are constructed in rice starches and considered the supreme important cationic derivatives were produced by various di alkyl-chloride reagents [12,13]. The aim of this work is to evaluate a newly synthesized cationic rice starch polymer to be applied in the industrial petroleum waste water clarification. Natural waste broken rice was obtained locally from the Egyptian market. Tri ethylamine LR (M.W 101.19) was supplied by S.D. Fine Chem. Poicha (R) 391340. Epichlorohydrin 99% was supplied by Merck-Schuchardt. Sodium hydroxide was supplied by Spectrum, Hong Kong. Ethyl alcohol was supplied by Adwic, Germany. Commercial ferric chloride (FeCl3) was used as an inorganic coagulant. In addition to other analytical grade chemicals which were used for water analysis (TABLE 1). Rice starch isolation by the sodium hydroxide method: The sodium hydroxide method  was used, where the broken rice (20 g) was mixed for 3 h at 25°C with 0.5 M aq. NaOH (50 ml) and the slurry filtered. The filtrate was centrifuged for 20 min, the supernatant was discarded, and the sediment was washed twice with distilled water (50 ml) and centrifuged. The residue was suspended in water and adjusted to (pH=7) by adding (1 M) hydrochloric acid, and the slurry was centrifuged. The supernatant was discarded, and the dark tailings layer top of the starch was carefully scraped away and discarded. The starch was washed three times with water (50 ml) until the tailings fraction became negligible after yield was (65%) centrifuging. The starch was dried in a convection oven at 40°C for 48 h.
Preparation of cationic starch polymer: According to previous work , quaternary ammonium salt (QAS) was prepared using triethylamine-hydrochloride and epichlorohydrin to produce 3-chloro-2-hydroxy propytriethyl ammonium-chloride. The cationic rice starch prepared by a technique based on the dry state process  as follows: sodium hydroxide solution (2 g) in 5 ml dematerialized water, then 5 g of finely powdered isolated rice starch was added. Stirring was continued to ensure the formation of alkali rice starch via rising the temperature of the mixture to 60°C, then 1 ml of QAS was added. The temperature of the mixture was adjusted at 60°C for 20 min. The reaction product was then precipitated by ethyl alcohol and washed thoroughly with ethyl alcohol/water (80/20) till alkali free then dried in thermoelectric oven at 60°C. A simulation of the clarification applying Jar Test  method which is considered the most applicable way to permit the comparison of various chemicals combination for determining the optimum chemical program. The most important measurements in jar test are coagulation and/or flocculent dosages, flock size, settling characteristics, flock forming time, and finished water clarity. The flocculation in the afore mentioned jar test method contains a set of six beakers (1 liter) in conjugation with multiple stirrers. Each beaker was filled with one liter of waste water and stirred at 100 rpm. The different doses of coagulant were added rapidly and stirred for 3 minutes. The stirring rate was then reduced to 50 and 20 rpm for a time period of 5 and 10 minutes respectively to allow complete flock formation, and then stirring was stopped. The comparative settling rate, flock size and supernatant clarity were recorded. After a settling time of 15 minutes, 250 ml of supernatant water were siphoned-off for further analysis. Ferric chloride dose: Different concentrations of ferric chloride doses were added to waste water in the range of (15-50) ppm. at intervals of 5 ppm. Turbidity, organic matter, colloidal silica and chloride ions were tested to determine the optimum dose of ferric chloride that gives the best result of water clarity. Cationic rice starch dose: Cationic rice starch doses of 2-12 mg/l at intervals of concentration 2 mg/l were added to waste. The above-mentioned parameters were elevated to determine the optimum dose of cationic rice starch used as coagulant aid. Combined coagulant dose: A mixture of ferric chloride and cationic rice starch was prepared and the same parameters were determined where three different concentrations 15, 25 and 35 mg/l of ferric chloride were selected, for each one of them, four different concentrations of cationic rice starch specifically 2, 4, 6, and 8 mg/l, were added successively. The best condition for clarification of waste water was determined. Testing and analysis: All determinations and chemical analyses were carried out according to the standard method of ASTM . Removal of turbidity, organic matter, colloidal silica, and chloride ions from waste water samples were studied in case of both coagulants separately and in mixtures. Enhanced results were obtained by applying cationic rice starch alone or in combination with ferric chloride. FIG. 1 shows the results obtained upon using different concentrations of ferric chloride. It is clear that an improved removal of both organic matter and turbidity from waste water had occurred better than those reported in the previous work [19,20]. A concentration of 40 mg/l is considered the optimum dose of ferric chloride alone that gave finest clarity of waste water. Also, FIG. 2 represents the results obtained by concerning the variation of colloidal silica and chloride ion with ferric chloride concentrations, which provide its capability to removing colloidal silica at 40 mg/l by coagulation process of waste water. FIG. 2 indicates that increasing ferric chloride concentration led to increase chloride ions in the water that causes different problems to the industry and to the human health . 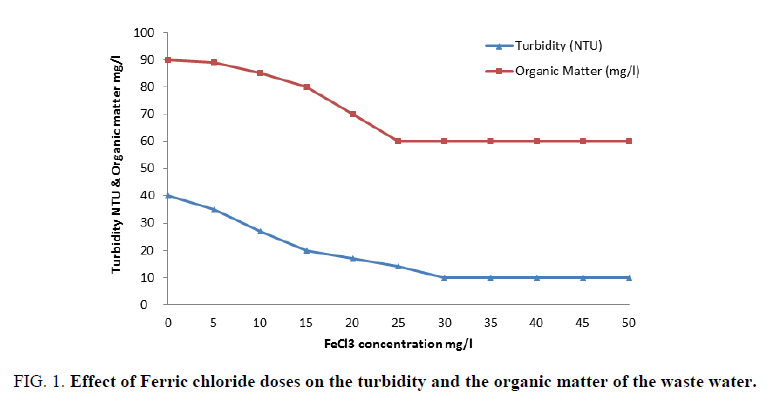 Figure 1: Effect of Ferric chloride doses on the turbidity and the organic matter of the waste water. Figure 2: Effect of Ferric chloride doses on the colloidal silica and the chloride ions concentrations of the waste water. Cationic rice starch was used in doses of 2-12 mg/l. The examined parameters revealed that cationic rice starch is able to remove organic matter, turbidity, colloidal silica and hence improving waste water clarity. FIG. 3 and 4 showed the optimum dose that gives the best result is 10 mg/l. Also, it is obvious from FIG. 4 that increasing cationic rice starch concentrations resulted in a decrease in the chloride ions concentrations of the waste water. This may solve the problem of using ferric chloride alone as coagulant which increases the harmful chloride ions in water. Figure 3: Effect of cationic rice starch doses on turbidity and organic matter of waste water. Figure 4: Effect of cationic rice starch doses on the colloidal silica and chloride ions concentrations of waste water. FIG. 5 and 6 showed that maximum turbidity removal was obtained on using a mixture of 25 and 6 mg/l of ferric chloride and cationic rice starch respectively. Also, FIG. 6 shows that maximum removal of organic matter was obtained at the same combined dose. Figure 5: Effect of cationic rice starch doses on turbidity of waste water at different Ferric chloride concentrations. Figure 6: Organic matter removal from waste water using combined cationic rice starch/ferric chloride doses. As mentioned before, the optimum doses of ferric chloride and cationic rice starch were 25 and 6 mg/l respectively. Concerning their effect on the turbidity, organic matter, colloidal silica and chloride ions content were studied and showed in FIG. 7. The lowest doses of addition were chosen where the dose of rice starch was kept constant at 6 mg/l and different doses of ferric chloride verses the measured BOD, COD and TSS (Total suspended solid) were taken. FIG. 7 showed that the dose of 30 and 6 mg/l of ferric chloride and cationic rice starch respectively recoded the maximum BOD removal reaching 42% then remained constant by increasing ferric chloride dose. The same trend was observed at 25 and 6 mg/l ferric chloride and cationic rice starch for each of COD and TSS which gave percentage reduction reached to 32 and 35 respectively as can be seen from FIG. 8. Figure 7: COD removal from waste water at combined cationic rice starch 6 mg/l with different ferric chloride doses. Figure 8: TSS removal from waste water at combined cationic rice starch 6 mg/l with different ferric chloride doses. 10 mg/l of natural biodegradable cationic rice starch polymer produced from broken rice starch was applied successfully in the clarification of oil refinery waste water and showed an improvement in the removal of organic matter, turbidity, and colloidal silica without an increment in chloride ions. Also 6 mg/l of the proposed polymer mixed with 30 mg/l of ferric chloride showed an improvement in the water quality with reduction of chloride ions and best removal of (BOD), Also, a combined dose of that polymer 6 mg/l and 25 mg/l of ferric chloride gave reduction in both (COD and TSS) reached to 32% and 35% respectively. Nevertheless, removal of turbidity and organic matter was attained when using that combined dose. Meyers RA. Handbook of Petroleum Refining Processes. 3rd ed. McGraw hill Publication. 2004. Parkash S. Refining Processes Handbook. Elsevier Science and Technology Books. 1st ed. 2003. Sawyer CN. Chemistry for sanitary Engineering. McGraw-Hill book Co. New York. 1960. Hocking MB. Handbook of Chemical Technology and Pollution Control. Elsevier Science and Technology Books. 3rd ed. 2006. AisyahI S, Norfariha MN, Megat-Azlan MA, et al., Comparison of synthetic and natural organic polymers as flocculant for textile wastewater treatment. Iranica J Energy and Environ. 2014;5:436-45. Hameed MAR. Use of environment friendly starch as flocculent in raw water turbidity removal. Aust J Basic and Appl Sci. 2014;8:113-21. Hafez AI, Khalil NA, Hashem AI. Synthesis and characterization of cationic chitosan-nanoparticles as coagulant in the water treatment. Inter J Adv Sci and Tech Res. 2014;6:126-46. Alley ER. Water Quality Control Handbook. 2nd ed. New York: McGraw Hill Publication. 2010. Rajendran R, Balachandra S, Sudha S, et al. Natural coagulants: An alternative to conventional method of water purification. Intern J Pharm Res and Biosci. 2013;2:306-14. Borchate SS, Kulkarni GS, Kore VS, et al. A review on application of coagulation-flocculation and ballast flocculation for water and wastewater. Inter J Innov in Eng and Tech. 2014;4:216-23. Ghanmode A, Chavan FI. Performance evaluation of some natural coagulants. Int J of Civil and Structure Eng Res. 2015;3(1):368-75. Chesters SP, Darton EG, Gallego S, et al. The safe use of cationic flocculants with reverse osmosis membranes. Desalination and Water Treat. 2009;6:144-51. Maruti PSV, Rao BS. Environmental science a low cost water treatment by using natural coagulants. Inter J of Res in Eng and Tech. 2013;2:239-42. Guo NY, Jianzhou YL. Synthesis of triethylamin-based-epoxychloropropyltriethyl ammonium chloride. J Text Res. 2009;30:61-4. Hafez AI, Tera FM, El-Shereafy EE, et al. Synthesis and application of cationic rice starch as a flocculant for water treatment. Inter J Adv Sci and Tech Res. 2014;46:156-68. American Society for Testing Materials (ASTM). Standard Practice for Coagulation-Flocculation Jar Test of Water. ASTM D-2035.PA, USA ed. 1980;11. Gibbs EL. Annual Book of ASTM Standards. American Society for Testing Materials. 2001;11. Mesdaghinia A, Rafiee MT, Vaezi F. Control of disinfection by products formation potential by enhanced coagulation. Int J Envi Sci and Tech. 2005;2:(4):335-42. Ebeling JM, Sibrell PL, Ogden S, et al. Evaluation of chemical coagulation-flocculation aids for the removal of suspended solid and phosphorus from intensive recirculating aquaculture effluent discharge. Aqua Eng J. 2003;29:23-42. Bartram J, Callan P, Hashizume H, et al. Guidelines for Drinking-water Quality. World Health Organization(WHO). 2004;1(8):1-4.